Government contracting has been on the rise, but many open records laws fail to address transparency issues related to information held by private contractors, who receive significant amounts of money from the government and perform public functions. Paul Light, professor at New York University, found that in 2005, private companies received $400 billion from the federal government through government contracts. This enormous figure does not even include the billions of dollars spent by cities and states on contracts with private companies. 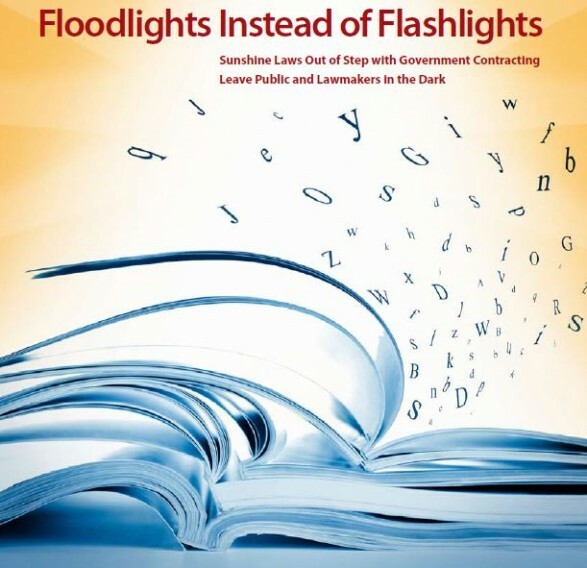 Floodlights Instead of Flashlights explores the real-world consequences of privatization on government transparency and the public’s access to information. During Sunshine Week 2012, we acknowledge many advances in important government transparency measures, but there’s still a lot of work to do. Our research shows that the increasing use of government contractors to perform public functions is limiting our ability to acquire important public information. This disturbing trend is occurring at all levels of government. As the stories from across the country in this report show, corporations are circumventing open records laws claiming that documents and records related to government functions are “proprietary information” exempt from disclosure. Even basic information about a government contract and the accompanying procurement process can be difficult to obtain. Corporations may not diligently collect data and information related to public programs and services, leaving the public record incomplete. In all these situations, the public loses access to information about the public’s own government. Our open records and sunshine laws exist because we believe that there is an overriding public interest in making government information widely available. A number of states enacted these laws in the wake of the Watergate scandal, to ensure that the public could monitor government activities. By skirting open records laws, private corporations are essentially allowed to perform public functions behind a veil of secrecy that we would never tolerate from public servants. At a time when privatization has been under scrutiny for cost overruns, declines in service quality, degraded workforce standards, waste, and the growing political influence of government contractors, we must promote and protect transparency in government contracting. This report examines various types of public information that we lose through privatization and presents numerous case studies to illustrate how this loss negatively impacts our communities. The report also highlights recent attempts to improve transparency, and provides recommendations to improve the public’s access to information, better ensure that critical public information is not being lost, and bring government contractors out of the shadows. Findings: What do we lose? How are public dollars being spent? From the basic to the most complex, financial information, such as underwriting for a government project, data about how a company derives rates charged to the residents, pricing information, or payment schemes can be denied, destroyed, or never made available. Who is employed by contractors and why? Workforce data, such as executive and employee compensation information, information about hiring, promotions, and firing decisions, and other employee information, such as criminal backgrounds. What recommendations and insights do contractors provide the government? Contractor work products, such as reports, policy recommendations, or any other document that the contractor produces to fulfill its contractual obligations. Are companies performing public services doing a good job? Performance data, such as records that describe how a program or service is performing. For example, information about the type of care a child is receiving in a state’s foster care system. Also, information contained in outside audits and reviews. What terms are included in government contracts with private companies? Are negotiations taking place behind closed doors? Often, it can be difficult to obtain a contract between a governmental entity and a private corporation. Information about the procurement process, meetings between the government and the company, bid proposals and related documents are often shielded from the public as well. Without information to help answer these important questions, watchdog organizations, journalists, advocacy groups, and interested residents lose the ability to understand government policies and actions, monitor public spending, inform their positions on various issues, advocate for what they believe in, and hold the government accountable. A well-functioning democracy relies on the public having honest answers to these key questions. Privatization should not make this information more difficult for the public to obtain. As local, state, and federal government continue to contract out critical public functions, privatization will continue to pose barriers for open access to public information. Lawmakers, government agencies, media, and advocates must take actionable steps to ensure that information controlled by government contractors is made public. certain types of information be made public. Repeal laws that directly reduce transparency: Laws that specifically exempt entire industries or areas of public information from open records laws are directly opposed to the public interest. They allow, and even encourage, corporations to hide public information. These laws should be repealed, and their corporate beneficiaries should be subject to the same open records requirements as other contractors. Require public contracts to contain transparency provisions: Government contracts should include specific provisions explicitly describing what contractor information will be made public. By including these provisions in the contract, the government can make its commitment to openness and transparency a priority at the very beginning of the contracting process, before the contract is even signed. Improve government collection of contractor data: Governmental entities should be vigilant about collecting data from contractors, to ensure a complete public record from the start. Governmental entities could include provisions in the contract that penalize the contractor if they fail to regularly submit certain information to the government or abide by open records laws. Increase online disclosure of contracting-related information: Governmental entities should increase online disclosure of government expenditures, including providing access to all contracts. A complete list of contracts should be listed online with identifying information, including dates of contract, contracting agency, contracting amount, and what the contract was for. Copies of contracts should be included in an easily searchable format. Regular reporting on the contracting process: The media should regularly monitor and report on their government’s contracting activities. This report could take the form of a weekly write-up that describes what large contracts are up for bid, and any important details that are known, such as what companies are bidding, and a description of the main issues at stake. The media can also highlight opportunities for stakeholder input, such as public hearing dates and important deadlines to encourage public participation in the contracting process. Be persistent: Media and advocates can face numerous barriers to attaining information about government contracts and private contractors. This includes delays in releasing information, requiring specific information about the requested information that the requestor may not have access to, or even bringing costly lawsuits to prevent the release of public information. By continuing to request information, and using creative ways to overcome barriers, media and advocates can prevent public information from being hidden.